Portland Trust, a commercial real estate developer and asset manager headquartered in Prague, and its long-term joint venture partner ARES Management today announced the acquisition of Office Park Nové Butovice in the Czech capital for €65 million. Office Park Nové Butovice, which has a total floor size of 36,000sqm and includes one of Prague’s few high-rise office buildings with panoramic views over Prague 13, was purchased from real estate investment company CEE Property Development Portfolio 2 (CPDP 2). Portland Trust intends to refurbish the 36,000sqm of office space with a rental target of €13 per sqm and rename it the Coral Office Park. Cushman & Wakefield are the letting agents. 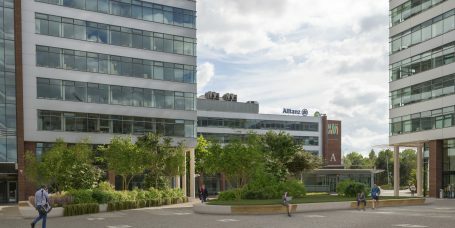 The main elements of the refurbishment will include the creation of a large garden and seating area in the center of the four office buildings, extension of the restaurant, installation of LED lighting throughout, new entrance lobbies, electric car charging points, changing rooms for cyclists and full signage rebranding.